Port Moresby traffic police have charged a senior officer for driving under the influence of alcohol, reckless driving and driving without a license. Senior inspector Samuel Jamagu, the director for the McGregor Barracks-based national security unit, was slapped with three charges of driving under influence of alcohol, driving without due care and attention and driving without a license (driving license expired). He was taken from McGregor Barracks to the Four Mile premises of the traffic police and arrested and charged on Tuesday early this week. According to reports the officer was in the company of an Asian in a Royal Papua New Guinea Constabulary (RPNGC)-owned Toyota Land Cruiser when he bumped into a station wagon, the impact resulting in the car bumping another two vehicles – including a Tulait Tulait taxi – in front of it on John Guise Drive. It is understood the police vehicle has been impounded at the traffic police premises. Sergeant Jeffrey Kiandu from the RPNGC traffic police said drinking-and-driving is bad practice and an offence under the Motor Traffic Act. “For a member of the constabulary to be involved is also against the Police Act, we have to be responsible and considerate of our own safety as well as others,” he added. The owner of one of the vehicles that was bumped in the October 1 incident told this newspaper that a complaint has been laid with the police. In a posting on social media, the vehicle owner said the police officer was intoxicated and in the company of a foreigner in the offside and an unidentified man in the backseat. “He (police officer) was heavily intoxicated along with an Asian guy offside and another civilian at the back of the Police land cruiser. The Tulait Tulait taxi was completely squashed and there was heavy damage to the taxi. The elderly driver was shocked and rushed to the hospital,” the vehicle owner posted on Facebook at 11.44 pm on October 1. 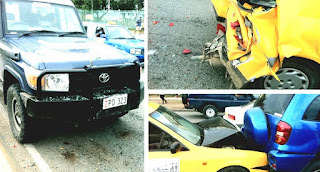 Both the vehicle owner and the police officer turned up at Boroko traffic office to report the matter, where the latter alleged that the former tried to assault them.